Expand "Statistics" section in left navigation bar and click on "Articles" link to view reports/statistics related to articles in Articles Statistics page. By default, Summary is displayed which shows the summary of your Knowledge base articles. 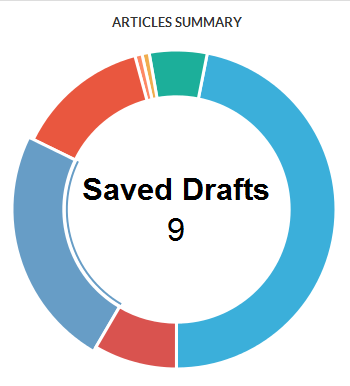 The right side shows the donut chart representation of the type of articles and their count. You can move the mouse pointer on any part of the donut to view a number of articles of that type in the knowledge base. The left side of the page shows the tabular representation of the article facts. Total Number of Articles: This field displays the total number of articles present in your knowledge base. In ML editions, count displays the total number of articles for language selected in language drop-down. Published Articles: This field displays the total number of published (approved and featured) articles. # Article With Ratings: This field displays the total number of articles which have been rated by end-users. Most Popular Article: This field displays name of the published article that has been viewed maximum number of times. You can click on the name to preview the article. Most Rated Article: This field displays the name of the article which has received highest user ratings. Most Popular Author: This field displays name of the author whose articles has been viewed maximum number of times. You can click on the name of author to view author’s detail. # Article with Rating <= 2: This field displays the total number of articles which have received ratings less than or equal to 2. # Articles with Rating >2 & <= 4: This field displays the total number of articles which have received ratings greater than 2 and less than or equal to 4. # Articles with Rating >4: This field displays the total number of articles which have received ratings greater than 4. # Article Subscribers: This field displays the number of persons who are subscribed to knowledge base articles.